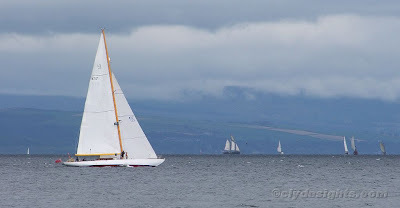 Built a little over fifty years ago, the 12-metre Bermudan sloop SCEPTRE was designed by David Boyd as a challenger for the Americas Cup, and entered the waters of the Holy Loch at Alexander Robertson's Sandbank boatyard in April 1958. Unfortunately, at her first race at Newport in Rhode Island, she was beaten by another challenger and then returned, defeated, to the UK. Sols, she was shortened by 3 feet and had her mast moved aft. Following the alterations, she raced successfully for many years until 1976, when she was placed in storage and restoration commenced. Now owned by 'Sceptre Preservation', SCEPTRE, which is built of wood on steel frames, has recently taken part in the West Highland Yachting Week. She is due to remain on the Clyde, based at Rhu, for the remainder of this season. Lovely sleek vessel, lovely picture also !! Think i caught this here earlier!